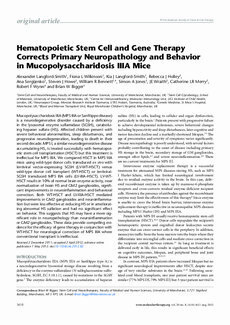 Mucopolysaccharidosis IIIA (MPS IIIA or Sanfilippo disease) is a neurodegenerative disorder caused by a deficiency in the lysosomal enzyme sulfamidase (SGSH), catabolizing heparan sulfate (HS). Affected children present with severe behavioral abnormalities, sleep disturbances, and progressive neurodegeneration, leading to death in their second decade. MPS I, a similar neurodegenerative disease accumulating HS, is treated successfully with hematopoietic stem cell transplantation (HSCT) but this treatment is ineffectual for MPS IIIA. We compared HSCT in MPS IIIA mice using wild-type donor cells transduced ex vivo with lentiviral vector-expressing SGSH (LV-WT-HSCT) versus wild-type donor cell transplant (WT-HSCT) or lentiviral-SGSH transduced MPS IIIA cells (LV-IIIA-HSCT). LV-WT-HSCT results in 10% of normal brain enzyme activity, near normalization of brain HS and GM2 gangliosides, significant improvements in neuroinflammation and behavioral correction. Both WT-HSCT and LV-IIIA-HSCT mediated improvements in GM2 gangliosides and neuroinflammation but were less effective at reducing HS or in ameliorating abnormal HS sulfation and had no significant effect on behavior. This suggests that HS may have a more significant role in neuropathology than neuroinflammation or GM2 gangliosides. These data provide compelling evidence for the efficacy of gene therapy in conjunction with WT-HSCT for neurological correction of MPS IIIA where conventional transplant is ineffectual.